The Oakland Raiders had eight starters age 30 or older last season. You could hardly find a group of people less likely to share an ethos with the counterculture movement of the 1960s than NFL decision makers. But increasingly, they don’t seem to trust anyone over the age of 30, either. 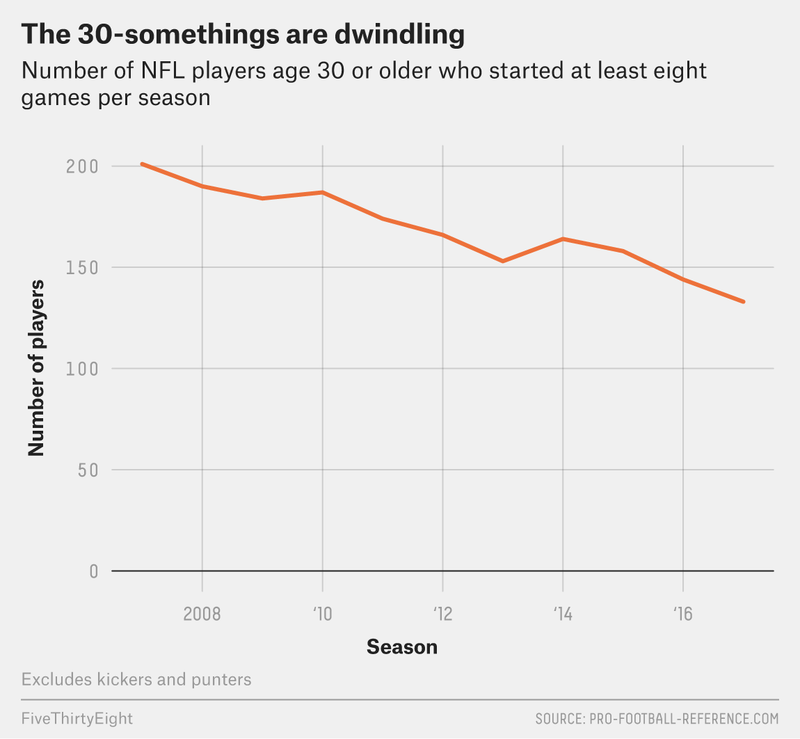 In 2007, there were 201 players — not including kickers and punters — over 30 who started at least eight games, according to Pro-Football-Reference.com.1 That number was down to 133 last season, equating to roughly four per team. That’s a drop of 33.8 percent. Roster construction appears to be a big factor. Last year, the eight division winners spent an average of 52.1 percent of their total salary cap on their top 10 players.2 That left only about half the available money for 80 percent of those teams’ rosters. This would mean that a lot of minimum contracts are being used to fill in the gaps — and because minimum salaries increase according to service time, only the elite 30-somethings may be surviving. This isn’t necessarily the wrong strategy. Once they hit 30, average players are either in the midst of or rapidly approaching the downside of their careers. Data shows that players at all positions generally see performance declines by age 30, with players’ peak ages ranging from 24 for running backs to 28 for most offensive linemen and quarterbacks. The subsequent declines are gradual from year to year, but the result is pronounced for all positions. So teams seem to be prioritizing younger players who are hitting their peak or ascending at the expense of veterans. There are certainly high-profile examples of older players still at the top of their game. But even the New England Patriots, who have been witness to the age-defying brilliance of 41-year-old Tom Brady, haven’t stockpiled older players. Brady was joined by only three other Pats players 30 or older who started at least eight games last year: Danny Amendola, Patrick Chung and Devin McCourty. And the Patriots let Amendola leave via free agency to the Dolphins. Teams in the past have bucked this trend, though. The George Allen-coached Washington teams in the 1970s were nicknamed “The Over-The-Hill Gang” after they systematically traded draft picks for veterans. In 1971, the average age of Allen’s starters was 29.4, and the team had 11 starters over the age of 30. But Washington won nine games that season and 11 the following year, in which they regularly started nine 30-somethings en route to the NFC championship. Could there be a market inefficiency in older players today, similar to the one that Allen exploited nearly 50 years ago? It seems like Jon Gruden is determined to find out. Last year, the Raiders had eight 30-something starters, tied with Arizona for the league high. A total of six — safety Reggie Nelson, tackle Donald Penn, running back Marshawn Lynch, tight ends Jared Cook and Lee Smith, and defensive end Bruce Irvin — remain. And the team has added linebacker Derrick Johnson (36 this year), safety Marcus Gilchrist (30) and wideout Jordy Nelson (33) as projected starters. Plus, the team signed 32-year-old Dominique Rodgers-Cromartie last week to fortify an injury-depleted defensive backfield. Gruden was surprised that he was even available. So it seems like the Raiders are set to put a lot more gray into the Silver and Black. For that, in today’s NFL, they don’t have much competition. Pro-Football-Reference.com gives a player’s age for the season as the age he was on Dec. 31 of that season. The Saints spent the lowest share on their best players at 42.4 percent, but that was due largely to one of the most productive rookie classes in history. And players on rookie contracts, which span up to five years when including option years for first-rounders, are huge bargains relative to their level of on-field production.